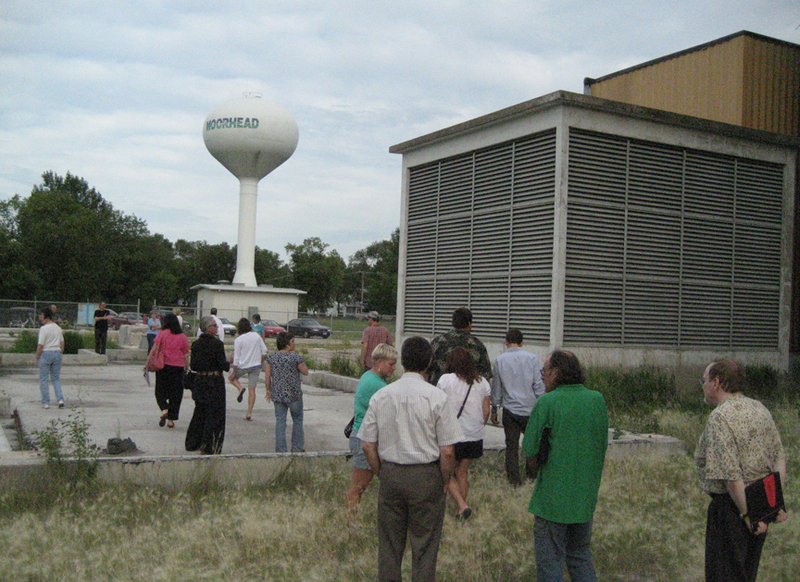 Artists, city officials, and community participants examine grounds and building of Moorhead Power Plant as a site for Defiant Gardens. Defiant Gardens for Fargo-Moorhead was a symposium and workshop organized by Plains Art Museum that brought together a remarkable group of eleven accomplished, conceptually rich artists, landscape artists, and writers to share ideas, images, and discussion with a diverse audience during September 11–14, 2009, in Fargo, North Dakota. The event explored the application of ideas from landscape architect Kenneth Helphand's study of gardens made under dire conditions Defiant Gardens: Making Gardens in Wartime (2006). Following Helphand's keynote address, artists presented their past work and discussed their ideas about what "defiant gardens" in contemporary urban settings could imply. After the symposium, the artists each proposed a defiant garden project for a site-specific community setting in Fargo or Moorhead. Ten of these projects are now in various stages of design and development, and additional funding for implementation is being sought. Colleen Sheehy, project director, became director and CEO of the Plains Art Museum in October 2008. She has twenty-eight years of experience in art museums. From 1993 to 2008, she was director of education and a curator at the Weisman Art Museum, University of Minnesota-Minneapolis. She has organized international conferences, including one on retail architecture, urban design, and the Mall of America; several architecture exhibitions; and numerous programs on urban space, architectural design, and real and imaginary landscapes. With a PhD in American studies, she has worked on issues related to landscape, architecture, the built environment, placemaking, and public art for more than twenty-five years. Her wide-ranging projects include The Flamingo in the Garden: American Yard Art and the Vernacular Landscape; Cabinet of Curiosities: Mark Dion and the University as Installation; and Metroscapes: Suburban Landscapes of the Twin Cities and Beyond. She served on the board of Forecast Public Art from 1995 to 2000. Kenneth Helphand, keynote speaker and inspirational guide for this project, is Knight Professor of Landscape Architecture at the University of Oregon and author of Colorado: Visions of American Landscape; Yard Street Park: The Design of Suburban Open Space (with Cynthia Girling; and Dreaming Gardens: Landscape Architecture and the Making of Modern Israel. His Defiant Gardens: Gardening in Wartime documented heretofore unknown gardens built in battlefield trenches in World War I and in the concentration, POW, and internment camps of World War II. His work shows that even in the most brutal environments, gardens continue to flourish. These "defiant gardens" are created in the most extreme social, political, economic, or cultural conditions. 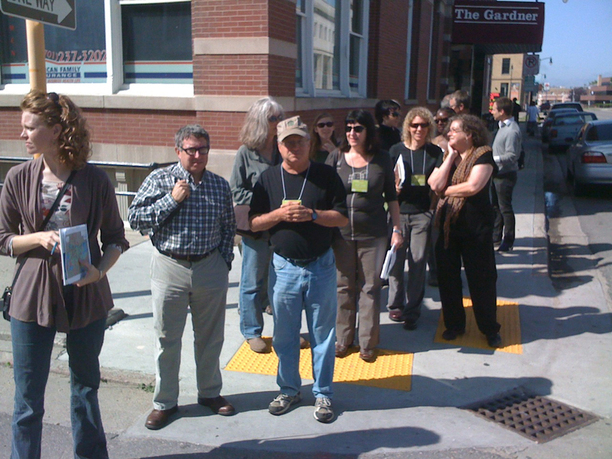 Helphand is a graduate of Brandeis University (1968) and Harvard University's Graduate School of Design (1972), and is a fellow of the American Society of Landscape Architects. He is chair of the Senior Fellows at Dumbarton Oaks. Born in Tokyo, Japan, in 1940, Kinji Akagawa taught sculpture at the Minneapolis College of Art and Design until 2008. World renowned for his sculpture and public works, Akagawa was commissioned by Walker Art Center, the City of Minneapolis, and the City of Houston, among others. His exhibitions have been presented at the Milwaukee Institute of Art and Design and Walker Art Center. The McKnight Foundation named him the 2007 McKnight Distinguished Artist, the highest recognition for a Minnesota artist. His work demonstrates "the ecology of everyday spaces" and combines the simplicity of Japanese aesthetics with a deep passion for art's impact on public spaces. From Buffalo, New York, Christine Baeumler is an environmental artist who works in various media, including the creation of public landscapes. She received her BA from Yale and MFA from Indiana University. Baeumler's travels to World Heritage sites (the Australian Rainforest, the Great Barrier Reef, and the Galapagos Islands) have inspired artworks on the connections between ecology and evolution. Baeumler's concerns lie with the diminishment of ecosystems and species and with the "extinction" of human experience. She has spearheaded work in ecological remediation at sites in St. Paul, including a major renovation of the nature sanctuary on a former industrial site, which involved complex relationships with Native American groups, immigrant youth, the park board, and community organizations. She has exhibited her paintings, photography, video, and multi-media installations nationally and internationally. She is artist in residence for the St. Paul Watershed District. She is collaborating with poet Juliet Patterson on aspects of her proposal. Patterson is an independent poet and instructor at Hameline University, Saint Paul. Based in New York City and rural Pennsylvania, Mark Dion works internationally on installations, public art, exhibitions, teaching, and writing. Dion has had more than seventy solo exhibitions in the United States, Europe, Brazil, and Japan. His ongoing concern is concepts of "nature," explored through natural history museum collections, art collections, and in the public field. His greenhouse with a large nurse log laid in a bed of soil and plants is a centerpiece of Seattle's Olympic Sculpture Park. In 2007, Dion was featured in the PBS series Art21. In 2008, he received the Lucelia Artist Award for the production of a significant body of work and sustained, exceptional creativity. A native New Yorker, Stevie Famulari currently lives in Fargo, North Dakota, and teaches landscape architecture at North Dakota State University. She creates LivingScapes and environmental art landscapes, indoor and outdoor greening, green murals, green fashions, building fronts and windows, sculptures, and design events nationally. Famulari's Earthworks range from the temporary to the long term. In her artwork, she strives to illustrate a site's energy, stories, and changes throughout a time period. Her art inspires others to appreciate the amazement, stories, and fun of landscapes with ephemeral, changing, and long-term designs. Based in Brooklyn, sculptor Rob Fischer explores natural ecosystems built into unexpected sites, such as industrial settings. For one piece, Early Swamp, he built a pond into an auto-chop yard, then photographed all of the botanical and animal species that grew there. Fisher works with found objects, most often cast-off industrial materials. A major work made from found objects was featured in the 2005 Whitney Biennial. He has had solo exhibitions at the Corcoran Gallery and Armand Hammer Museum. His work is held in the collections of the Museum of Contemporary Art, Chicago; the Whitney Museum; the Corcoran; and the Los Angeles County Museum of Art. His defiant garden is being designed collaboratively with Kevin Johnson. The two often work as an artistic team. Based in Los Angeles and working internationally, Fritz Haeg earned a BArch in architecture from Carnegie Mellon in 1992. He has forged a multidisciplinary career moving among the creation of landscapes, architecture, performance, dance, sculpture, exhibitions, happenings, and other social events. He created projects at the Tate Modern, San Francisco Museum of Modern Art, MASSMOCA, the Whitney Museum, and other major museums. His work Animal Estates was created for the 2008 Whitney Biennial. 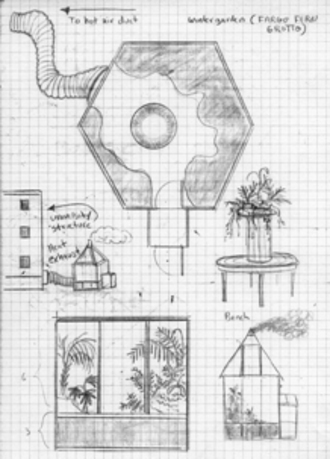 Edible Estates is a serial project on vegetable gardens, landscape, and health. In multiple realms of art production, Haeg is interested in the power of social discourse. Based in St. Paul, Seitu Jones is a sculptor, public artist, and landscape architect. Jones has created more than thirty large-scale public artworks. His numerous awards include a Loeb Fellowship in the Harvard Graduate School of Design. 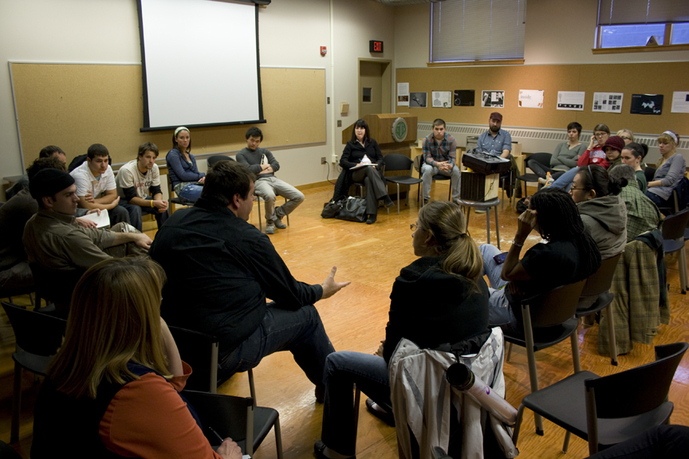 Jones was millennium artist-in-residence for 651 Arts, in Brooklyn, New York, during 1999–2000 for the National Artist and Communities Initiative. Currently he is the city of Minneapolis's first artist-in-residence for the Department of Community Planning and Economic Development. Jones is heading a team that will integrate art into the light rail station designs in the Twin Cities. Since 2000, he has designed sculptural elements for storm-water treatment projects. Originally from Minneapolis and now based in Brooklyn, Kevin Johnson holds MFA degrees in sculpture and environmental design from the Minneapolis College of Art and Design, and a BFA from the University of Minnesota. Johnson has been awarded public art commissions for gardens and plazas in Washington state and the Twin Cities. His sculptures have been commissioned for hospitals and places of worship, and he has an active exhibition schedules at galleries and museums nationally..
Kathleen Pepple teaches landscape architecture at North Dakota State University, Fargo. A fiber artist, sculptor, and landscape architect, she also holds an MA in regional and community planning. She began her private practice in 1991 as Kathleen Pepple Landscape Design. Her research interests center around building techniques and community sustainability for urban agricultural gardens. Based in Schafer, Minnesota, Diane Wilson is an award-winning creative nonfiction writer. Her book Spirit Car: Journey to a Dakota Past won a Minnesota Book Award (2006). A master gardener, Diane maintains a butterfly garden filled with native plants. Besides writing, Wilson is executive director of Dream of Wild Health, a Native-owned, 10-acre farm in Hugo, Minnesota. Dream of Wild Health brings together Native American elders, adults, and youth to collect and grow indigenous heirloom seeds. Youth learn to garden, sell produce, and herbs at a farmer's market, and learn the ancient ways of Native gardening and medicine. Plains Art Museum brings people and art together to engage and inspire people in life-long learning and to cultivate understanding and motivation for the highest in human achievement. Begun in 1965 as Red River Art Center, Plains Art Museum incorporated in 1975 and moved into its own building in Moorhead. In 1997, the museum opened a large, renovated historic building in Fargo, and in 2003, earned accreditation by the American Association of Museums. Its collections and programs focus on contemporary art, national and regional. As the major art museum in Fargo-Moorhead (pop. 190,000), the museum serves K-12 students and teachers, college and university faculty and students, families and the general public, and through outreach, a million people in the wider region. The museum organizes original exhibitions, many of which travel nationally, and presents high quality exhibitions from other venues, including the Corcoran, the National Gallery, and Walker Art Center.